We love to see our partners! Please Contact Us to arrange a meeting. You can order credit reports through TAG on an as-needed basis! For more information on this valuable service click here. and contact us for pricing! As we reflect on 2017, we are thankful for our clients, key partners and friends, whom we value so highly. We are very fortunate to work with companies every day that are committed to expanding international trade, including several 2017 recipients of export honors among our client base, such as the U.S Department of Commerce's E award winners, Ex-Im Bank's Exporter of the year, Metro Chicago Export's Pitch Competition finalists and grantees, STEP grant awardees, and various State and SBA Export winners. Congratulations to all of you! 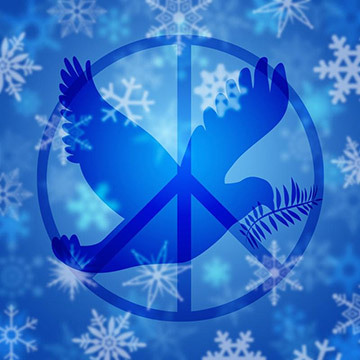 We at Trade Acceptance Group wish you a very peaceful holiday season and continued success in 2018! 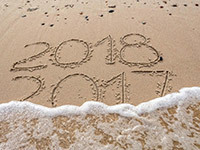 We look forward to assisting you next year and, as such, we are devoting this newsletter edition to highlighting resources available to grow your export business, while keeping in mind the risks associated with trade. 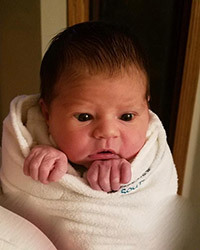 Finally, on another merry note, we are very excited to announce the newest member of the TAG team, Aria Elena Anderson! Mason become a new father this month! Congratulations to Mason and his family! Whether you are new to exporting or an experienced exporter, we encourage you to take advantage of Commerce's export services. The International Trade Administration of the Department of Commerce is the export market development agency of the U.S. government. Their mission is to expand export opportunities for U.S. products. The services they provide range from market research, identifying and evaluating potential trade partners, to arranging meetings overseas with buyers and promoting American brands at international trade shows. These services are provided through their network of domestic and international trade offices. A description of all of their offerings can be found at export.gov, along with the current user fees. To learn more about how the International Trade Administration can assist you, please contact your local U.S. Export Assistance Center. Are you interested in being more strategic about your export business? ExporTech is an intensive training program that assists 4-8 companies at a time in developing an export plan. TAG has served as a partner of ExporTech in the Midwest since its beginning in 2007, advising companies on Ex-Im Bank programs and international payment risk mitigation. The program founders developed ExporTech because they knew manufacturers could not rely solely on domestic sales for growth. If you think your company could benefit by participating in ExporTech, please contact us and we will connect you to your local ExporTech organization. For more information on ExporTech, click here. As you research foreign markets for export potential, be mindful of the risks of doing business in each targeted country. We advise our clients to refer to the credit insurance companies' risk maps, Ex-Im Bank's Country Limitation Schedule (CLS), and the U.S. Embassies' Country Commercial Guides to determine their foreign credit policy in challenging markets. 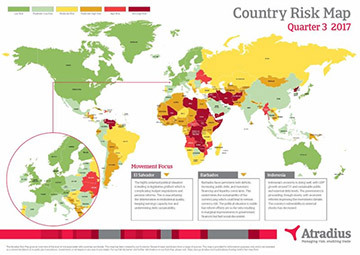 Atradius' most recent risk map is explained in detail here, and a copy of the most current (October 2017) Ex-Im Bank CLS can be found here. Also please refer to the credit insurance companies' country and economic risk updates included in this issue. Are you concerned about large concentrations with your domestic trading partners or your exposure to the retail industry? These are just a few reasons why companies protect their balance sheet by insuring domestic receivables. As a specialty broker of both domestic and foreign trade credit insurance, we can canvass the private trade credit insurance options to find the best coverage for you. Or, we can explore the accounts receivable put market for more challenging credits. Please contact us if you have any questions about mitigating your domestic trade risk. As always, we value our relationship with you. If we can be of assistance in any way, please let us know. We appreciate your feedback! Please let us know what you think. If you have ideas for content you'd like to see in future issues, do let us know. Remember, "We Work for You!" Are you interested in having a representative from TAG speak at your event or make a presentation at your company? Please Contact Us Today!